Criminal convictions, even low-level misdemeanors, can seriously and negatively impact a person’s goals and life decisions. The most common problem is denial of employment due to a negative criminal record even after several years since conviction. Additionally, old convictions can result in the denial of necessary loans (student loans, automobile, home), travel to foreign countries, ability to obtain security clearances for government-based employment, or even affect family law issues such as child support, visitation, or custody. 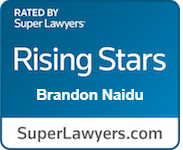 Attorney Brandon S. Naidu has extensive experience with the complexities of the expungement process in California and how to determine individual strategies for each client in order to help them move forward with their lives. How Do Expungements Work In California? Expungements are governed by California Penal Code section 1203.4, which provides a second chance for qualified individuals. The effect of the expungement–if granted–is that the original plea/conviction is withdrawn, the case is re-opened and dismissed, and the court orders the CA Department of Justice to update criminal records reflecting the change. Any restitution has been paid in full to any victim(s) in your case. What Are The Challenges To Bringing An Expungement Motion? Expungement presents certain challenges since the decision to grant the motion lies in the discretion of the judge. It is usually necessary to demonstrate to the judge that not only do you meet the eligibility requirements, but also that the “interests of justice would be served” if expungement were to be granted. This means that you need to demonstrate compelling reasons that outline substantial problems you are encountering due to your conviction and would justify granting your expungement. This is common in cases where expungement is not generally granted, such as, DUIs or where problems were encountered during time on probation. Other evidence that demonstrates to the judge that the conviction was an isolated event and not to be repeated. Call the Law Office of Brandon S. Naidu for a case evaluation and available options at (619) 363-4811.